High-speed train fares are a key factor in the level of ridership and the revenue forecast. 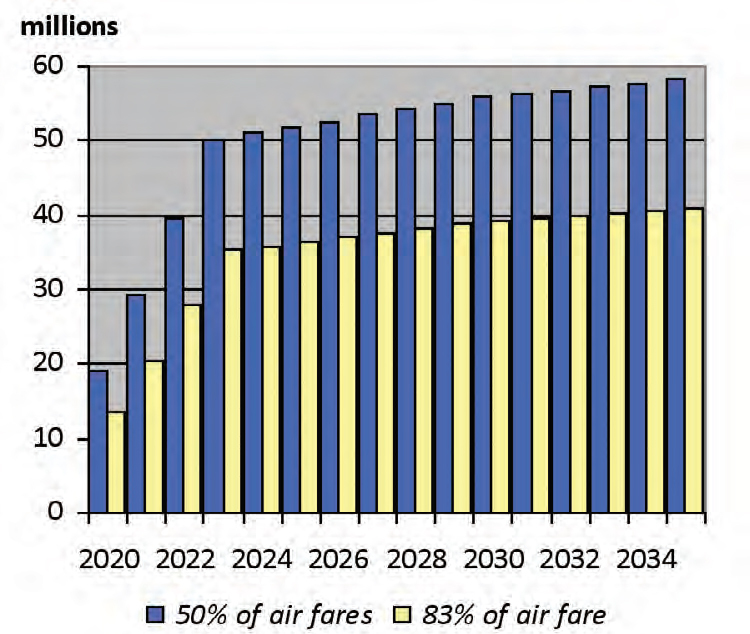 Forecasts for the programmatic EIR/EIS work used fares based on an LA–SF fare at half (50 percent) of the 2005 air fare, and varied proportionally with distance for other trips. This “50 percent” fare level generates relatively large passenger flows without requiring operating subsidy, and creates large public benefits from the public investment. Because of the importance of increasing the amount of private sector funding in the construction and procurement of the project, the 83 percent fare scenario was adopted for this business plan. In other words, the CHSRA wants to generate maximum profits for the PPP private investors, at the expense of taxpayers (who happen to be the biggest investors in the project). The result is nearly 20 million fewer annual trips. A large fraction of these 20 million trips will be taken by automobile on congested highways. Other potential trips simply won’t occur at all, resulting in lower economic activity and mobility. The 83 percent level is in the middle of a wide range of experience in similar-length markets outside of California, based on prices examined in 2007. At the top end, weekend Acela fares in the New York to Washington market were higher than air fares, and the Japanese Shinkansen fares were 108 percent of air fares for Tokyo-Osaka (322 miles) and 114 percent Tokyo-Hakata (722 miles). London – Paris Eurostar HST fares were 80 percent of air fares, both peak and off-peak. Madrid – Sevilla (333 miles) AVE fares were 71 percent of air, and Paris Lyon (244 miles) 71 percent of air. Contrary to its earlier fast services, SNCF intended the TGV service for all types of passengers, with the same ticket price as for trains running on the parallel conventional line. To counteract the popular misconception that the TGV would be another premium service for business travellers, SNCF started a major publicity campaign focusing on the speed, frequency, reservation policy, normal price, and broad accessibility of the service. This commitment to a democratised TGV service was further enhanced in the Mitterrand era with the promotional slogan Progress means nothing unless it is shared by all. BTW, readers are encouraged to play around with rail and air fares on tgv.com and airfrance.com. Is there any evidence for this supposed 71% fare model on Paris-Lyon? Experimental evidence with online bookings indicates a ~20% fare model on the route. Some amazing video of TBM cutter head break through the 34th St. cavern wall. This completes phase one of number 7 subway extension. As an Electrical Engineering student in college, we had a classroom assignment to design, build, and program a card reader using standard, off-the-shelf parts. It a regular, junior-year class where students had 1 week to complete the assignment in Lab. Granted, these were read-only cards, but hey, this was back in the 1980’s. TransLink, the oft-delayed regional one-stop transit card, is going through a re-branding process. With the universal card expected to pass a number of major milestones this year, including its implementation into both the Valley Transportation Authority (Santa Clara County) and SamTrans systems, the folks behind the plan think it’s a good time to reintroduce the technology with a new name and a fresh spin. Plus, a bunch of transit agencies are already using the generic-sounding TransLink for other purposes. An early recommendation by the Metropolitan Transportation Commission, which oversees the Translink program, is to rename the card Clipper, which apparently, will evoke memories of the fleet-moving Clipper ships from the days of yore. 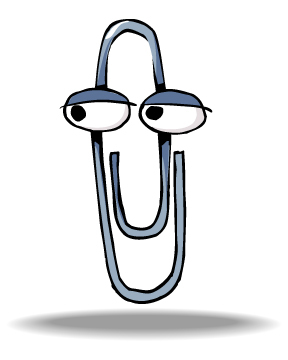 In fact, the word Clipper will evoke memories of “Clippy” — the handy, dandy Microsoft Assistant widely reviled by users as intrusive and annoying. What better word to parody MTC technological incompetence? Unbelievable Ridership Numbers in Latest CHSRA Business Plan? Do these computer-model numbers make any sense? Palmdale (population: 150k) would see almost as many boardings as Los Angeles (population: 3.8 million). Anaheim (i.e. Disneyland) is projected to have travel demand as great as San Francisco (i.e. terminus for most Bay Area travelers). Computer models are only as good as the assumptions and data fed into them. Garbage in, garbage out. State researchers must redo a report that concluded 3,500 people prematurely die each year due to diesel pollution – a finding that was used to justify imposing the nation’s strictest regulations on diesel engines. The California Air Resources Board ordered a new report after the employee who wrote it was found to have lied about his academic credentials. That decision was made Wednesday after an air board hearing on the rules, which critics want to delay because of concerns over the cost of retrofitting and replacing the polluting engines. The head of the air board, Mary Nichols, apologized for not telling all board members about the problem with the report’s author, Hien Tran, who claimed he had a doctorate in statistics from UC Davis, when he actually had obtained the degree from an unaccredited distance learning school. Nichols knew about the problem before the board voted on the regulation. Tran has since been demoted. You mean, he wasn’t fired? The BART board voted to award $440 million in contracts for the construction, operation and maintenance of the 3.2-mile Oakland Airport Connector. Construction of the automated, driverless train system that would whisk passengers to the airport in 14 1/2 minutes is scheduled to start next summer and take 3 1/2 years. This, for a line with no intermediate stops. Bicycling would be faster! SMART hasn’t even started running yet, and already it is likely cyclists will be bumped. Christine Culver of the Sonoma County Bicycle Coalition said there will be a large demand for bicycle space from commuters and tourists alike, and she would like to see 15 percent of the seat space devoted to bikes. “Sonoma County is bicycles, the people who ride bicycles is growing exponentially,” Culver said. It’s a trade-off, SMART spokesman Chris Coursey said. The more amenities, the fewer seats. The cars can hold 70 to 80 seats, but a bathroom takes up six seats, two bicycle racks take up two seats and a snack bar takes up six seats. It is very disappointing to see SMART staff propose the use of bike racks. And it is even more embarrassing that bikes might get bumped to accommodate a wine bar or power room. Bike racks are an outdated and inefficient solution for on-board accommodation of bikes on trains. The problem with bike racks is quite evident to anyone who has tried to bring a bike onto Caltrain: cyclists routinely get ‘bumped’ from otherwise empty trains simply because the bike racks are full. The preferred method for on-board bike accommodation is to treat bikes like any other large bulky item — no different than baby strollers or suitcases. Provide a large ‘flexible-use’ space, preferably in the vestibule area. This space can be used for: wheelchairs, luggage, bikes, or (if trains are SRO) standees. Passengers are surprisingly good about figuring out for themselves how to best manage space, in a way that is far more efficient and flexible than bike racks. This is the approach taken by BART and most European operations. Sadly, even if SMART staff were to follow industry best-practice, they still may have no choice but to rely on racks. 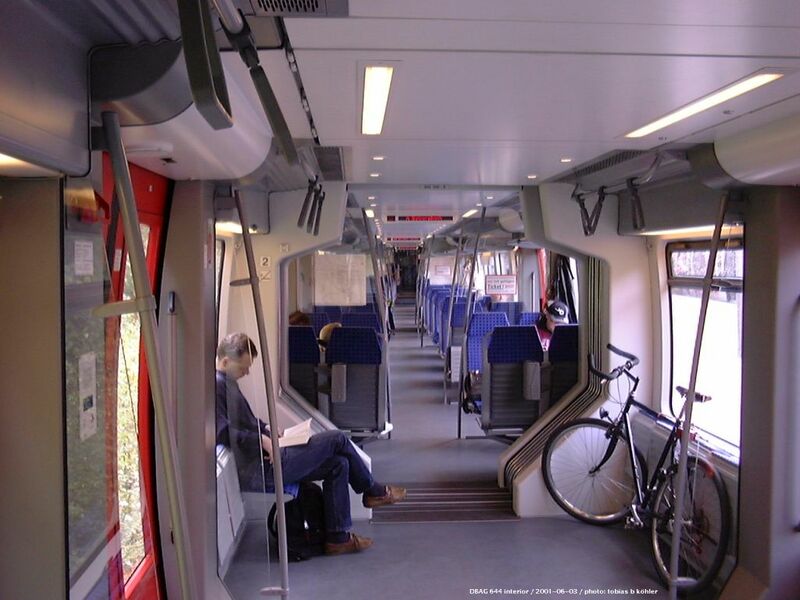 With its ill-advised decision to run heavy DMUs, the FRA is going to require bikes to be strapped into racks, which could limit how many bikes will be permitted. An example of industry best practice of flexible-use space near the doors. Passengers can figure out amongst themselves how to arrange their luggage, bikes, and wheelchars in this area. The articulated design and wide aisles makes it easy to distribute load evenly along the train, in case the space gets overcrowded.